Composed of on-trend printed papers, creative notebooks, kits and timeless papers essential for manual activities, the Clairefontaine ‘Creative Leisure' range will delight children and adults alike. Rich in colour and texture, it fulfils creative needs as well as Clairefontaine's requirements in terms of quality, expertise and environmental commitments. Feelgood Creativ'books offer four handicraft activities in each pad: writing, colouring, origami and accessory making. It is a simple and efficient way to relax and create. This creative pastime also promotes wellbeing, appeases the mind and develops imagination. Need inspiration or want new techniques? Creativ' paper boxes are the solution! In each box you will find all the supplies for a creative project. From decorative objects and pads to calendars, there is a box for all the tastes. Choose one that suits you or offer a creative gift to your loved one. Colouring is now assimilated to art therapy. Focusing on colouring and drawing can be a source of wellbeing and meditation. There are many benefits of this practice such as anti-stress, concentration, increase of self-esteem and expression of personality and artistic choices. Originally from Japan, the art of folding paper is fun and accessible to all, both beginners and the initiated and can be as simple or complex as desired. Beginning with a single square of paper and a pinch of imagination, you will give free rein to creativity, creating animals, flowers, decorative objects and more without cutting or gluing. Clairefontaine offers a wide range of products for scrapbooking, including objects to customise, specially designed paper and embellishments to let your imagination run wild. Create beautiful creations for birthdays, weddings or as a thoughtful gift. Paper materials provide much flexibility and many possibilities for decorating, packaging, scrapbooking and other creative activities. Special papers get their name from the very specific effects and textures they provide; whether they are metallic, glittery, corrugated, or something else, all you have to do is choose. Rich in colour and quality (with water-resistant, fireproof and metallic options), crepe paper is a must in creative and educational activities. It can be used for packaging, manual activities, school displays, both indoors and outdoors. Mainly used for packaging, silk paper is also suitable for many creative activities. With a great finesse and delicacy, it brings softness, elegance and a touch of transparency to projects. New for 2019, silk pompoms can create an elegant and refined decoration for summer celebrations. A perfect touch of fantasy, silk papers can create a trendy, festive and warm atmosphere. 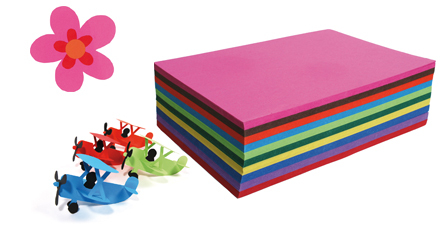 These papers are perfect for organising creative activities in groups, with a variety of options and colours perfect for nurseries, schools, colleges and creative groups.